CARANA Corporation was hired by USAID to write and produce a manual to teach East African farmers proper crop conditioning in order to minimize post-harvest crop losses and maximize profit. CARANA wanted the design of the manual to be easily read, and to have each of the four sections clearly identifiable and they contracted Cultiva Studio to design the manual. Lisa used both color and the texture of each of the four crops to visually define each section. The final manual was digest size, spiral bound, and the covers and section divider pages were laminated for durability. Both CARANA and USAID were thrilled with the manual. CARANA Corporation describes the content of this report as: From the recently completed Market Linkages Initiative (MLI)—one of the few USAID food security projects to address marketing and storage of staple foods—CARANA has distilled key lessons for food security programming in East Africa and beyond. The report was very important to CARANA to document the positive results of their two-year MLI program. CARANA had previously reached out to Lisa, at Cultiva Studio, to design the Crop Conditioning Handbook that had been used as a part of the MLI program to train independent farmers in East Africa. 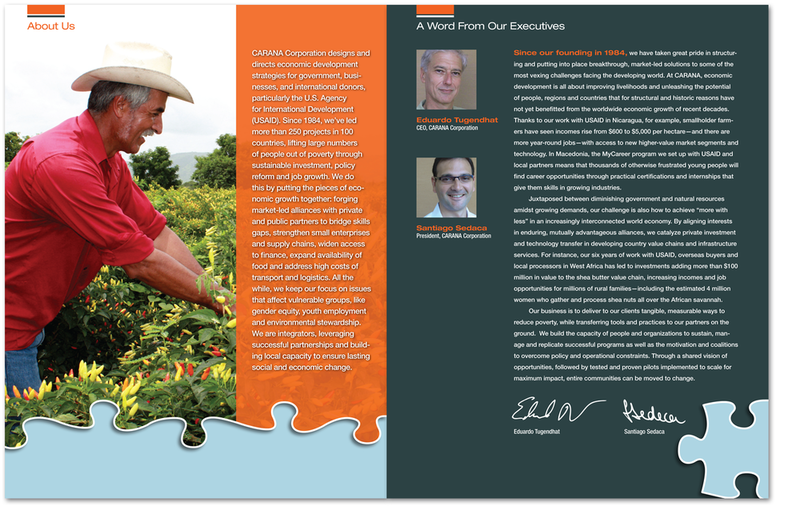 So once again they decided to hire Cultiva Studio to design the MLI Lessons Learned Brochure. Lisa followed USAID’s overall design guidelines while also producing an easy to read brochure with emphasis on elegant typography, eye-catching infographics, and showcasing the project’s photos. CARANA’s Communications Director had worked with Lisa on the project and was very happy with the results. The Communications Director received high praise from both CARANA’s Vice President, and CARANA’s President for the brochure. CARANA Corporation needed to rewrite and redesign their company brochure. They wanted to promote their capabilities to both current and prospective clients. 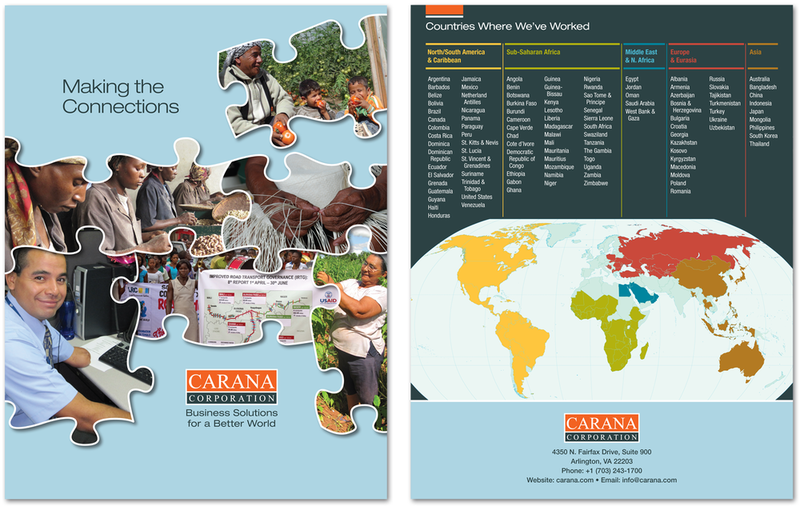 CARANA describe themselves as a consulting firm that designs, directs, and delivers economic growth strategies to government, private business, and international donor agencies, particularly the U.S. Agency for International Development (USAID). CARANA has worked with Cultiva Studio on several projects and asked Lisa to design their brochure. The theme for the brochure was “Making the Connections” and Lisa used connecting puzzle pieces to emphasize the theme.